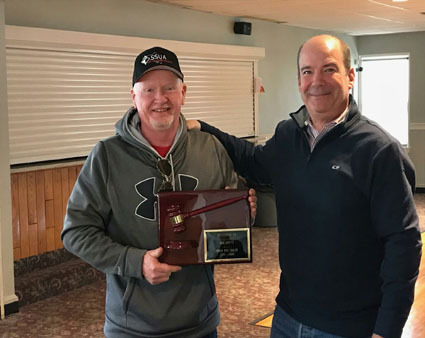 Immediate Past President Moe Duffy (L) and present MBUA President Mike Rabideau (R) receiving a standing ovation from his fellow umpires at the January 27th meeting for his two years of service. representing approximately 2500 high school umpires. This site provides dates and agendas for upcoming meetings, prior meeting minutes and important information for association members. We've also provided links to other baseball association sites. Please click HERE for the latest rules interpretations including the new Intentional Walk Rule. Please click on the "Contacts" tab above to send us feedback,or comments. 1. The primary uniform of the MBUA shall consist of the following items; a) A navy blue jersey adorned with an MBUA badge on the left breast pocket, b) Charcoal grey trousers, c) A navy blue hat adorned with the MBUA logo,d) A black belt, black shoes, and black socks, e) A navy blue or red undershirt, the sleeves of which are not exposed, f) A navy blue ball bag, and g) A navy blue pullover with red epaulets or navy blue or black blazer. 3. Alternatively, an umpire may wear a black or cream jersey. If he does so, the following items shall be worn; a) Charcoal grey trousers, b) A black hat adorned with the MBUA logo, c) A black belt, black shoes, and black socks, d) A black undershirt, e) A black ball bag, f) A black pullover with white epaulets. 105 CMR 201.000: HEAD INJURIES AND CONCUSSIONS IN EXTRACURRICULARATHLETIC ACTIVITIES, and in the best interests of our student athletes, all MIAA Tournament Directors and Tournament Assignors will require successful completion of an MDPH approved concussion training program as a condition for an official accepting an MIAA tournament assignment. Your acceptance of an MIAA Tournament contest assignment will be considered as implicit confirmation that you are a member in good standing with your local board, that you are enrolled with the MIAA, and that you have successfully completed a concussion training program as required by the MDPH. All new members of local boards should be sent to all three of the MBUA endorsed suppliers (listed at the above "Links" tab) to receive each vendors offered discounts. MBUA patches are available to local associations from the MBUA, Secretary / Treasurer.